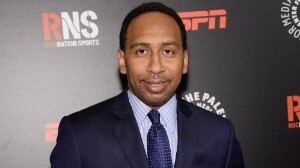 ESPN on Tuesday announced a one-week suspension for one of its most controversial commentators, Stephen A. Smith, in the wake of his widely-criticized remarks about domestic abuse that referred to possible “provocation” by victims. The move came one day after Smith appeared on his ESPN2 talk show “First Take” and profusely apologized. Steven A Smith’s point was that, he feels, a women shouldn’t provoke a man to the brink of self defense or blind rage simply because they feel a man shouldn’t hit them. Strangely enough, a week or so prior, Steven A. Smith made comments that it was ridiculous that a man should have to apologize for his opinion and that it is ridiculous that the general public expects that. Well, I guess ESPN showed who’s the boss. Sad case of control.